As many of you may have heard, on the 22nd of July 2014 the pilot of an Airbus A320 reported sighting a “small black object” to the left as he prepared for landing at Heathrow airport. The airbus was 700ft up when the object was reported passing approximately 20ft over the wing. The pilot was able to land the plane safely, but stated “it was a distraction during a critical phase of flight.” The UK Airprox Board(UKAB) gave this incident an A rating, meaning that there had been “a serious risk of collision”. Investigations were unable to trace the operator responsible. This incident demonstrates a need for a greater public understanding of drone operations. As statistics come through about the volume of drones being sold monthly and marketing campaigns push for making a drone the gift to get this Christmas, the importance of understanding the rules and regulations surrounding this emerging industry has never been greater. The operator of the drone involved in the Heathrow near-miss was breaking numerous regulations from take off. The Air Navigation Order 2009 defines a congested area as being “any area of a city, town or settlement which is substantially used for residential, industrial, commercial or recreational purposes.” You must have permission from the CAA to land or operate within a congested area. Article 138 of the ANO states “A person must not recklessly or negligently cause or permit an aircraft to endanger any person or property”. I believe not only the pilot of the airbus, but the UKAB agrees flying a drone within 20ft of an aircraft is reckless when they gave this incident an A rating. Additionally articles 166 and 167 state the operator must maintain direct, unaided visual contact to monitor its flight path, the operator must not fly in Class A, C, D or E airspace without permission from the air traffic control unit, operators shouldn’t fly at a height of more than 400ft or within 50m of any vessel, vehicle, or structure not under the operators control. New FPV regulations do allow for flights to be higher than 400 feet, but not in the class D airspace around Heathrow and a competent spotter needs to be with the remote pilot at all times. With at least one other drone near miss currently being put through the UKAB, it is possible that there are recreational drone pilots who may be keen to fly in these areas simply to obtain footage of manned aircraft in flight. I cannot stress how dangerous this could be for the crew and passengers of a manned aircraft. With the recreational drone market expanding, there’s no reason for anyone to be left stranded on the ground. If you or someone you know received a drone this Christmas it is important to understand the regulations. By following the regulations set out people can experience the wonder that flying a drone can bring without sacrificing any person or property’s safety. You can find more information on the legislation on the CAA Unmanned Aircraft page. 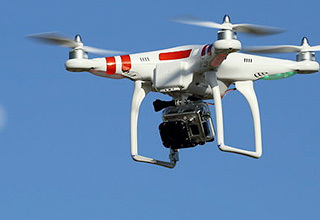 The CAA recently released an information leaflet for owners of recreational drones. If you are planning on getting or giving someone a drone for hobby flying you can find out more from the British Model Flying Association. 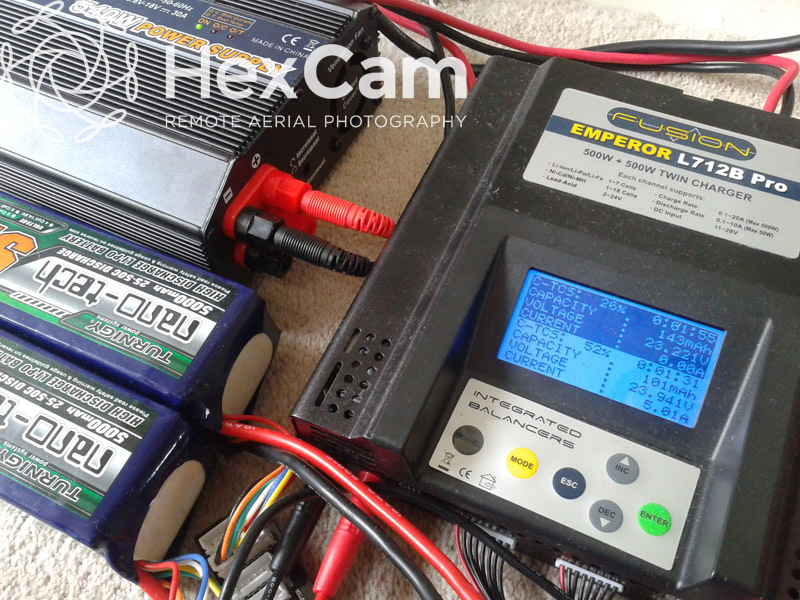 For initial UK drone flight training please contact us via the HexCam website. In early 2015, we hope to offer a full route to a CAA Permission for Aerial Work, which is required to operate drones commercially in UK airspace. New information and websites coming soon. We would like to wish you a happy and prosperous 2015. Anybody involved in UK RPAS operations should read this, input, and be prepared to deal with the implications. By Jonathan Bamford, Head of Strategic Liason. It’s fair to say that 2000, when we first published our guidance on CCTV, feels like a very long time ago. Back then, what we meant by CCTV needed little explanation, immediately conjuring up thoughts of video cameras on poles. How times change. Today we’ve begun consulting on an updated version of our CCTV code of practice that includes everything from automatic recognition of car number plates to flying drones. Those two examples are both from the emerging technologies section, which perhaps makes for some of the most interesting reading. There’s a section in there on body worn cameras, for instance, which have attracted headlines recently as the Metropolitan Police Service announced their roll out. Please note: This post is fairly out of date. Some of the information is still useful but please see this post as well. Even now, a couple of years after I got into this industry, there appears to be a lot of confusion about the format and purpose of the UAS, RPAS or UAV Operations Manual that is required by the Civil Aviation Authority (CAA) when registering for Permission for Aerial Work (PFAW) in the UK. As a result I thought I’d just write down a few thoughts now and maybe add to it later. As always, a little disclaimer: I get a lot of questions about multirotor equipment so I thought I’d start creating some posts about that. Please bear in mind that I learn a lot from reading around the blogs and forums and talking to people in RC shops so any inaccuracies are completely due to my own misunderstanding. By reading this you accept that, although I hope it will aid with your own understanding, it is written in good faith and I can’t take responsibility for any damage to yourself or your equipment that occurs through the use of this information. If you see anything that I have got wrong or you feel is dangerous, please contact me through the HexCam website or Facebook page and I will rectify it as soon as possible. What is the Operations Manual not? 1) It is not an instruction manual: Occasionally I get people sending me an Operations Manual for review and it is a print out of a Phantom or Wookong manual. So the first thing to say is an Ops Manual is NOT an instruction manual for your RPAS. There will be aspects of the Ops Manual that describe some of the functions but your system and transmitter instruction manuals should only feature as documents for reference in the manual. 2) It is not a “paperwork exercise” to be shoved in a drawer once you get your PFAW: Your Ops Manual is an absolutely key document that should be very carefully thought through and should be regularly used and updated in line with experience and the evolution of your business. If you feel it is just a hoop to jump through and are not prepared to read through the relevant CAA documentation (which isn’t a huge amount) then I suggest you walk away from this profession now. So what is your Operations Manual? Put very simply, your Ops Manual covers four things: Who you are, what you are flying, what you want to do with your RPAS and how you will do it safely. The core remit of the CAA is to ensure that all airspace users are operating in a way that ensures the safety of the public, property and other airspace users. As a result, the Ops Manual for the CAA only needs information about your RPAS to the extent that it impacts safety. So things like failsafe procedures will feature. Privacy will not feature, although I would suggest that you also begin to think about putting together some kind of privacy and data protection policy to hold separately within your business. Resource Group who run the RPQ-s and EuroUSC who run the BNUC-S both provide information and guidance on production of the Ops Manual when you carry out your theory ground school. Both companies also offer different levels of Ops Manual review, including paid options. You can also find a basic template on the CAA website as an appendix to CAP 722 (Section 3, Chapter 1, Annex 1) which on the PDF starts on page 73! There is also a direct link from the CAA UAS pages. If completing the BNUC-S, you will be required to submit a completed Operations Manual for approval in advance of your flight examination and you will not be able to complete the flight examination until the Ops Manual has been approved by EuroUSC. If completing the RPQ-s the Ops Manual does not have to be completed before the flight examination, but, as you have to demonstrate your operating procedures and use flight reference cards during your examination, it makes a lot of sense to complete the manual before the examination if possible. purposes of aerial work except in accordance with a permission granted by the CAA. with a permission issued by the CAA. aircraft must not be flown within 30 metres of any person. aircraft which is equipped to undertake any form of surveillance or data acquisition. If you want to operate beyond these limitations on a regular basis, you need to apply for an exemption at the time you apply to the CAA for your PFAW. So, for example, you might wish to apply for increased altitude, closer separation distances or night flying. The CAA have stated that they are happy to receive applications for exemptions to standard permissions as long as you can provide an adequate safety case for the exemption applied for, these are considered on a case by case basis. The CAA also consider one-off exemptions. The Permission for Aerial Work will look slightly different if your RPAS is heavier than 7Kg as it will include conditions for congested areas. Links to instruction manuals for the RPAS, Transmitter, AV equipment, relevant CAA documents. Your company details if applicable. A list of potential applications for your RPAS. Your operating procedure (to include, how you setup before you fly, pre-flight checks, in-flight procedures (take-off, flight, landing), post-flight checks and emergency procedures). Think about what you would do in the event of an incident and how the RPAS would behave in response to events such as transmitter loss, motor failure, malicious interference, GPS signal loss. How you will survey and risk assess each flight site. I suggest you stick to the CAA layout so it makes it easier for them to check your document, the skeleton documents provided by Resource UAS and EuroUSC broadly follow the CAA template. The key thing is to make it a manual that YOU (and your employees) can use practically in the office and the field. Don’t see it as an Operations manual “for the CAA”; it is a manual for you, that details exactly how you and representatives of your business will operate safely and legally in UK airspace. You just have to get it approved by the CAA to get your Permission for Aerial Work. Yes we can. We do provide assistance with Operations Manuals every now and again, using a model we have developed over the last two years, that has been approved by the CAA three times and was highly commended by EuroUSC. The cost will depend on the scope of your manual and will vary depending if it is a simple check of an already drafted manual or if it is a new manual to be written from scratch. Either way, we work closely with you to ensure that you take ownership of your manual, so that it is not just a copy of ours, but is a working document within your business. No we can’t. I’m sorry but due to the increasingly rapid changes in legislation and the differing requirements of the NQEs we can no longer help with the operations manual process. Last week the Civil Aviation Authority (CAA) published a list of UAS operators who have a permission for aerial work in the UK. In case you are wondering we are number 117! Although the list is now alphabetical. What’s so important about a list? Demonstrated competent flight skills either through the RPQ-s, BNUC-S, or pre-existing arrangements for early registrants. Carried out a flight examination to demonstrate both their own skills and the failsafe features of their aircraft. Carried out a theory examination demonstrating a working knowledge including meteorology, UK airspace legislation and operational safety. Submitted, and had approved, an Operations Manual showing their own operational, safety and risk assessment procedures. Submitted proof of public liability insurance. Agreed to maintain operational and equipment logs allowing pilot experience to be shown and encouraging good maintenance of equipment, motors and batteries. Where can I find the list? What should I do if the company I’m considering is not on the list? This follows on from my post on lithium polymer batteries but I just need to put in the same disclaimer! 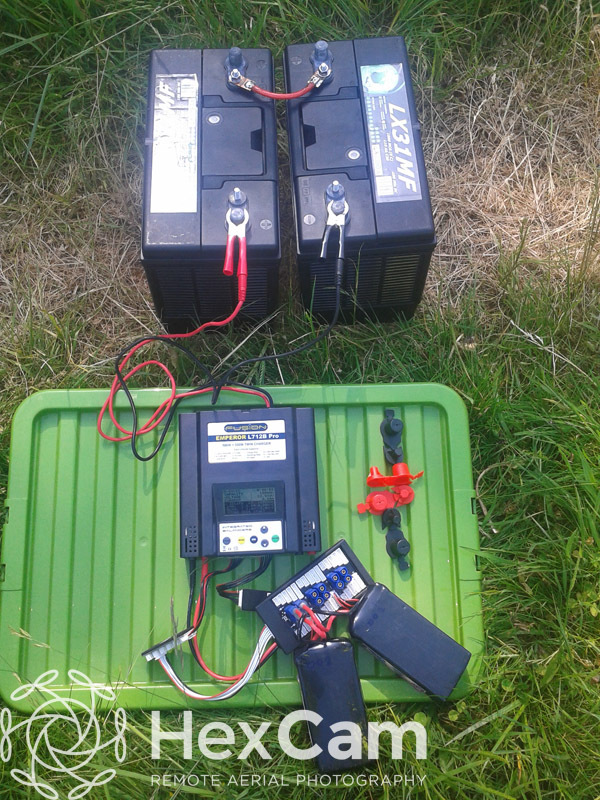 Getting the right lithium polymer (lipo) battery charger can be a real minefield. The main reason for this is that often the charger companies only tell half the story. So I will try to clarify it, but am not going to promise anything as I sometimes still get a little confused myself. It is, however, vitally important that you get the right charger for the kind of aerial imagery business you are running. If not, you will find yourself very frustrated. A decent battery charger and power supply can be pretty expensive. But as someone who has a number of “retired” chargers around the office, I would say that you need to see it as an investment. A good charger will maintain battery health, allowing batteries to remain in use for more charge cycles, it can also save you time if you don’t have to be monitoring the charger continuously just to get all your batteries charged in time! If you look across the net you’ll find all kinds of homebuild arangements for providing power. There are ways of doing this, and I have done so myself on occasion. However, I am also aware that for most people the idea of stripping down a server power supply is pretty daunting, so I’m going to focus on professional solutions that might just survive a portable appliance test! If you are up for a bit of homebuilding just have a look around the RC forums. People have built some amazing setups. What do I need to start charging lipo batteries? The first thing to say here is that lithium polymer batteries need a specific lipo charger. If you try to charge them with anything else you are risking a fire. The technology (and people’s understanding) has improved over the last few years. If charging indoors, keep the batteries in lipo bags or some kind of metal case. You are probably going to want two things… a mains operated charging system that can be used for charging back at base and a mobile system while you are out operating. Generally, the charger will be the same but your power supply will change. If you have bought something like a DJI Phantom you will get a neat little all in one plug and charger with it. No problem for small batteries like that so just get on with it and fly! I would still suggest following the 20% rule from my lipo battery post though. It is recommended that batteries are charged at a 1C charge rate. This means a 3000mAh battery should be charged at a maximum of 3 amps, a 5000mAh battery at 5 amps, etc. Many batteries are now rated for higher charge rates but there is a possibility of battery chemistry damage if high rates are used too regularly. If in doubt, charge at 1C or below. There are ways of doing this efficiently! I have just sat for about 5 minutes trying to work out how to start this so it may be a little incoherent on first release, I will try to hone it later. 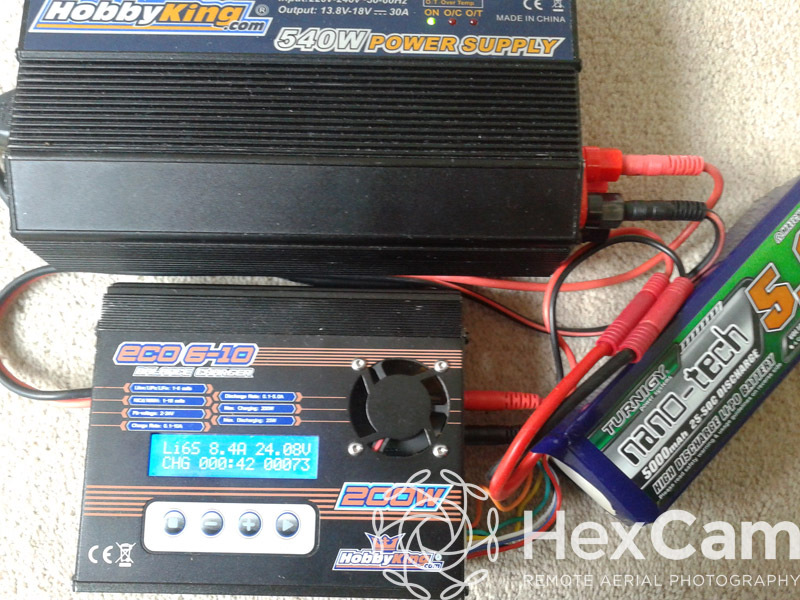 Most people find that their first charger is underpowered and wonder why it won’t charge their shiny new 6S lipos in under three hours! When buying a charger, you need to look for several things: input voltage, output voltage, maximum current (amps -A) and very importantly maximum power output in watts (W). I’m going to start by considering charging a single battery on a single channel charger as it is where most people start. Something like the imax B6. When you look at the box below, you think great; it’ll charge up to 5A, so my 6S 5000mAh battery will charge fully in an hour no problem… it even says so on the box… Right? 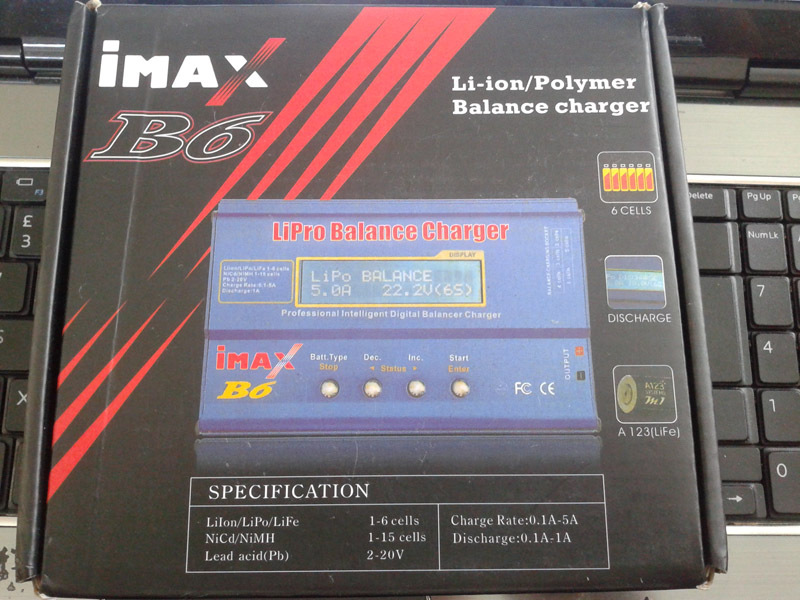 iMax B6… my first charger. Wrong. It is true that a 5A charge would give a 1C charge rate for a 5000mAh battery (5A = 5000mA). However, what this doesn’t take into account is the battery voltage or total wattage of the charger. The charger has an input voltage of 11-18V and a total power of 50 watts (not found anywhere on the box). In this example, I am using an 18V power supply capable of delivering 540W. As a result it can potentially power more than 10 of these B6 chargers at a time. As you can see from the next photo, the charger will only charge at 2.2A (less than 0.5C). The reason for this is that we are trying to charge a 22.9V battery at a maximum of 50W. The iMax B6 trying to charge a 6S 5000mAh lipo. Here is a simple equation: W = A x V. By rearranging that we get: A = W/V. So 50 divided by 22.9 is…. 2.18A. So basically, this charger is maxed out as it has hit the maximum 50 watt limit. At this rate the battery will take about 2 hours to charge. The B6 also has a 240 minute timeout set as standard (a good safety feature) so it may time out before it charges. We can quickly work out the maximum battery size that will actually charge at 5A on this charger using the same equation as before. So the maximum voltage that will charge at 5A is 50 divided by 10: 10 volts. Remember a 2S lipo has nominal voltage of 7.4V and a 3S is 11.1V. As a result, this charger would charge a 2S lipo at 5A but as soon as you get to 3S or more, the wattage will max out. 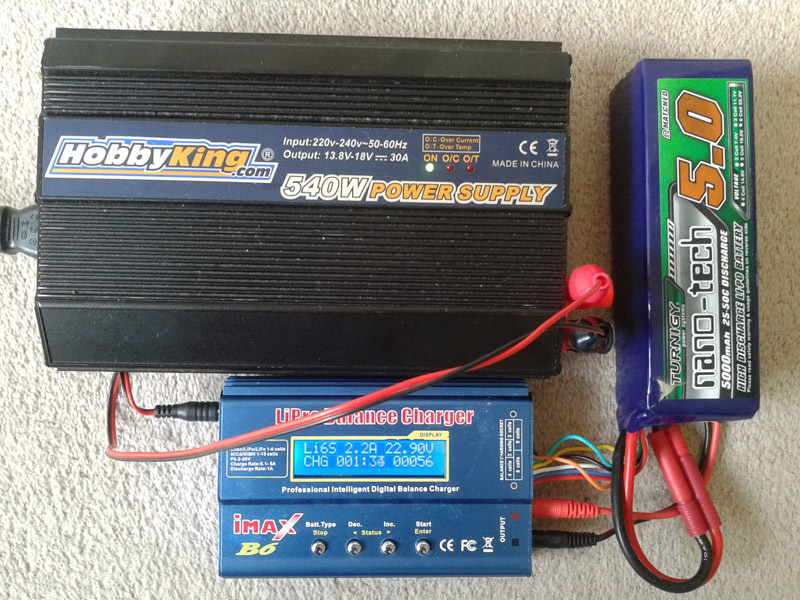 This charger does have its uses; I now use it to charge my 2S and 3S AV receiver and LCD batteries as it is a good lightweight charger and frees up my main charger for the big lipos. 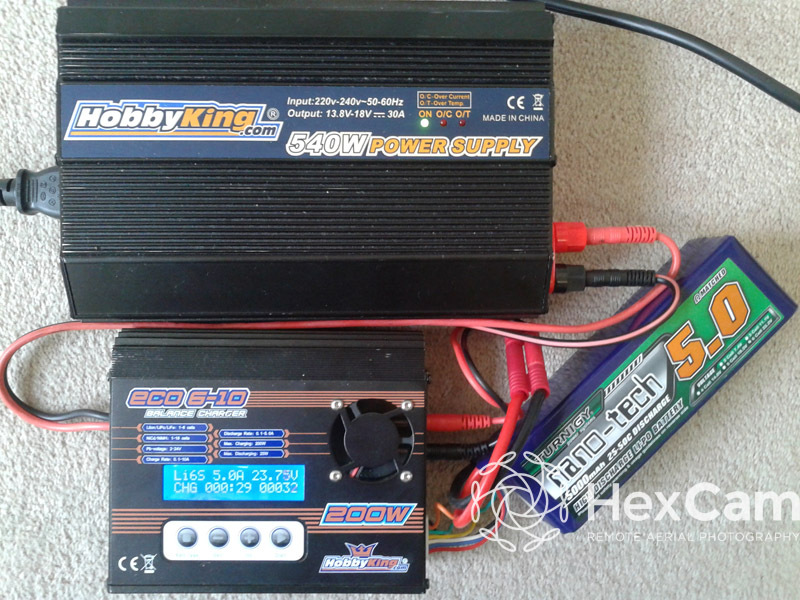 This next charger, the Hobbyking Eco 6-10 is very similar to the B6 in most ways. In fact, the user interface on a lot of these chargers is identical. You do have to manually choose a normal charge or balance charge. As you can see, with this charger I put in exactly the same settings and am getting a constant 5A charge. So what is the difference? Well, the big 200W on the front gives a major clue. The battery is currently at 23.75V as you can see if you enlarge the photo. Going back to our equation: A = W/V… 200W divided by 23.75 is 8.4, so theoretically this charger could charge my 6S lipo at up to 8.4A at this stage of the charge cycle. This charger will give a maximum 10A charge so I set it to that to see what would happen. As you can see from the next photo, The wattage has become the limiting factor as suspected and we are limited to 8.4 amps, which on this battery is a 1.7C charge rate (this battery is rated up to 5C charge). There are variations on these types of charger so that there are multiple chargers in unit. There are a few out there, that are basically four iMax B6 chargers in one box. The key thing to look for there is the wattage again, particularly with respect to the maximum wattage each channel can support. This charger gets taken everywhere! As you can see, both channels are plodding away at 5A no problem. There is also no balance charge option on this charger, the balancing is part of every charge (evening the individual cell voltages out so that they all end up as close as possible to 4.2V). It also gives you % charge and loads of other useful information on other screens. 500/23.94=20.88A, so I could charge this battery at the maximum 20A (a 4C charge rate). Alternatively I could charge 4 of these batteries in parallel at 5A on each channel, meaning I could charge 8 6S 5000mAh batteries in one hour. At this point a new limiting factor has come into play. In order to use the maximum 500W on each channel, I need to be able to use 1000W of power. You may remember, this power supply only provides 540W, so I’m going to be able to use about 270W per channel which means with this power supply I will only be able to charge 4 lipos at the 1C rate. In order to get the full potential from your charger, the power supply you are using must be able to supply at least the same wattage as the charger, so all I need to do to be able to charge my 8 batteries at a time is to buy a minimum 1000W power supply and it is sorted. Right? Pretty much! Just check that the power supply is also able to supply the minimum amps required too. Also, the charger will work most effectively if you are able to supply power at a higher voltage than the batteries you are charging. So to get the most out of my Fusion Pro I need a power supply that will provide a minimum of 40 amps at 24V and a minimum of 1000W total power. There are some people who will realise it isn’t quite that simple, but I’m trying to keep it as simple as possible. Make sure your power supply voltage does not exceed the voltage of your charger or you will blow it up! For example, I wouldn’t use the iMax B6 ona 24V supply as it is only rated up to 18V. Something like this SkyRC power supply is great as it has fully adjustable voltage and can provide up to 1200W at up to 50A which will easily let me use the full potential of my Emperor Pro. With chargers improving all the time even this power supply may not be enough! Up until now I have generally used a direct connection to my car battery to provide power to my charger when out on location with no mains power. I did experiment with an inverter to convert the output to AC and then plug in the 18V supply, but it was inefficient and also a mess of wires to set up. Using your car battery without the car running also runs the risk of draining the battery. Car batteries also aren’t designed to be deep cycled so you may be reducing the life of your battery. So now I am moving towards a system using either a 24V deep cycle leisure battery or two 12V leisure batteries in series to give 24V. Here, in a setup used by my friends at Rotarama, as you can see, we are using two 12V deep cycle leisure batteries in series to give a 24V output. These batteries have a combined capacity of 220,000mAh. Enough to charge Our 5000mAh batteries 44 times. More actually as you’ll remember, with the 20% rule, we shouldn’t be putting more than 4000mAh in each time anyway.. More than enough for a day’s work! If you look carefully at this picture, you will see that we currently have two batteries in parallel on the left hand channel and nothing on the right. As we use our batteries in pairs, it is logical that we charge them in parallel pairs too. Parallel charging can be carried out with any batteries of the same voltage. I feel it is best to only charge batteries in parallel if they are the same capacity and state of charge as well. You can see we are using a parallel charge board that will take up to 6 batteries in parallel. Which neatly leads us on to our penultimate section…. Bearing in mind the equation we talked about earlier, it may be possible to get more out of your charger by using parallel charging. If you look back at my battery post, you’ll remember that putting lithium polymer batteries in parallel is not only possible, but can be very advantageous at times. It works with charge as well as discharge. So if I put my two 5000mAh 6S in parallel and the balance leads also in parallel using the special board (parallel boards for most types of connectors are readily available at most RC shops and online) then I effectively have one 10000mAh 6S2P battery. As a result I can charge the pair at 10A and each battery is getting the equivalent of 5A (back to the 1C charge rate). If I added a third battery I would create a 15000mAh 6S3P battery which could be charged at 15A to give the 1C charge rate. I don’t like to get hyped up over danger. For every scary lipo fire you may see on the forums there are literally thousands of successful charges. Also, incidences seem to have reduced considerably over the last few years as technology and understanding has improved. However, there area number of things you can do to make sure you charge safely. Use lipo bags for containment in the event of a fire. 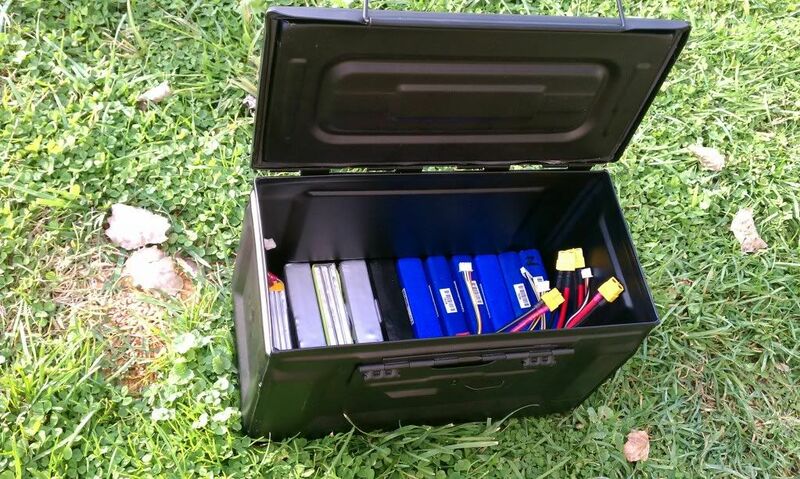 Store your lithium polymer batteries in a metal case. A lot of people use ammo cases! Always charge on a non-flammable surface. Keep a small portable powder fire extinguisher near your charge station and out on location. Keep a log of battery charges. Changes in capacity and cell balance can indicate a battery that is degrading. I hope all this helps to some degree. If you want to discuss anything, do get in touch! I am publishing this as I type… so more will keep appearing throughout the day. I get a lot of questions about multirotor equipment so I thought I’d start creating some posts about that. Please bear in mind that I learn a lot from reading around the blogs and forums so any inaccuracies are completely due to my own misunderstanding. By reading this you accept that, although I hope it will aid with your own understanding, it is written in good faith and I can’t take responsibility for any damage to yourself or your equipment that occurs through the use of this information. If you see anything that I have got wrong or you feel is dangerous, please contact me through the HexCam website or Facebook page and I will rectify it as soon as possible. Please treat lithium polymer batteries and multirotors with same respect you would give to other electrical and mechanical equipment. Look after them and they will look after you. What on earth is 3S, 4S, 6S etc? I’m not going to go into the chemistry of lithium polymer batteries in this blog, but the basic unit of the battery is the cell. A battery is generally made up of between 2 and 10 cells in series. Each cell has a nominal voltage of 3.7 volts and a fully charged voltage of 4.2 volts. So 3S means 3 cells in series. Putting cells in series multiplies the voltage of each cell by the number of cells. A 3S battery has a nominal voltage of 11.1 volts (3 times 3.7V) and a fully charged voltage of 12.6 volts (3 times 4.2V). A 6S battery (now standard on a lot of larger multirotors) has 6 cells in series so has a nominal voltage of 22.2V and a fully charged voltage of 25.2V. But I saw 6S2P!!! What is that? OK. Unlike most other types of battery, lithium polymer batteries can be connected in parallel (P) too. This is incredibly useful as it means by having two batteries the same connected in parallel you can maintain the original voltage but double the capacity. 6S2P means we have two 6S batteries connected in parallel. So, if each battery is 5000mAh, by connecting them as 6S2P we now have 10000mAh at 22.2V. In some uses this would effectively double the life of the battery. When flying, you have to take into account the extra weight you are adding with the extra capacity. As a result, if a single battery gives you 10 minutes of flight time running two in parallel will give you around 16-17 minutes. So, you lose some flight time but gain a degree of redundancy in the system in case of one battery failing. Your call! I prefer to fly with two batteries where possible. This one is a bit simpler, The mAh or Ah refers to the capacity of the battery. As a compromise between weight and power we tend to use 5000-6000mAh batteries and connect them in parallel. So a typical hexacopter will run on 6S2P with each lipo having a 5000mAh capacity, giving 10000mAh to play with, of which we recommend about 8000mAh is actually used. Leaving 20% in your batteries not only gives you a safety barrier, it also means that if you do suddenly need that last bit of power on landing, it is there. Discharging a battery repeatedly below 20% will cause damage to the battery chemistry which could then fail during flight or charging. I found some more numbers! 25-35C. What’s that!? Lithium polymer batteries almost always have a “C” (capacity) value associated with the other battery information. In fact, they may have two, one for charge rate and one for dicharge rate. The C value is the recommended or maximum rate at which current can flow through the battery without causing damage to the battery chemistry. These days batteries tend to start at around 20C for discharge (use) and can go up to around 100C. So what would a 1C rate look like? The easiest way to think of it is a 1C rate would use the capacity of the battery in 1 hour. So a 5000mAh battery used at 1C would be down to 0% after an hour. If you double the C rate it halves the time. So at 2C it would last 30 minutes and at 4C it would last 15 minutes. Most of my copters tend to use power at around the 5-6C rate when hovering, so a single 6C battery will last around 10-12 minutes. However, if I suddenly put my copter into full vertical lift it will draw more power and so the C rate will shoot up. If a battery says 25-35C, it means that the continuous discharge it can cope with is 25C with a peak discharge of 35C that should only be reached for seconds at a time. It is recommended that you choose a battery where all your usage will be at or below the continuous discharge rate. For most hexacopters 25C continuous discharge should be perfectly adequate. The discharge rates going up towards 100C are really aimed at pilots carrying out extreme flying with very rapid changes in power output, for example 3D helicopter flight. With aerial filming, the majority of flight is gentle movement and hovering. You have an intermediate amount of batteries and accept that as the day proceeds demand may exceed supply! This conundrum leads me into chargers and home and portable power supplies, which I will blog about in the next installment. I will also talk about lithium polymer battery safety soon as, although the safety has come on a long way in the last couple of years, lithium polymer technology should still be treated as potentially volatile, particularly when it comes to storage, transport and treatment after a crash.